More Info By Andrew D. Blechman Thursday, Feb 14, 2019 Life In the Berkshires It’s not easy to get on the front page of the Wall Street Journal. 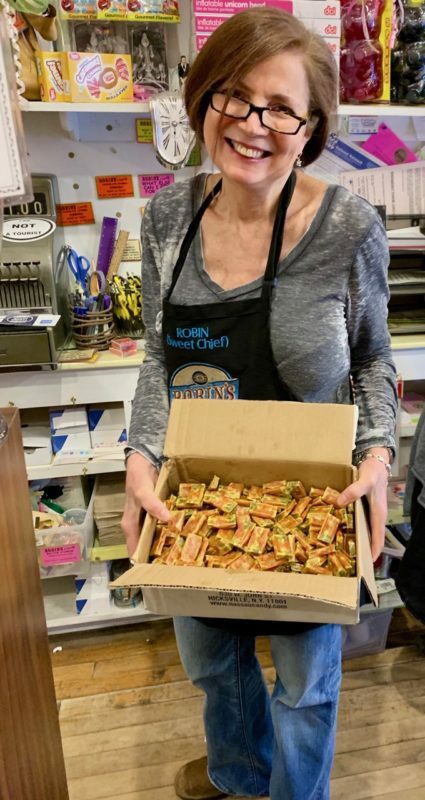 But the news of Robin Helfand, and her eponymous candy store in Great Barrington, was read by more than two million Journal readers this Tuesday and the story was far more sweet than sour. According to the Journal, Helfand was Smarties enough to corner the market on Sweethearts — those chalky font-kerning challenged but beloved heart-shaped candies that few romantics, from pre-school to Kimball Farms, can imagine Valentine’s Day without. Traditional confectioners have fallen on hard times, their brands often picked up by hedge funds keen to make a quick buck. Candy Dots on Paper, Jolly Ranchers, Malt balls, Smarties, Pez, Laffy Taffy, Sugar Daddies, Pop Rocks, Hubba Bubba. In an age of corporate franchises and bland selections, Robin’s Candy Store remains a carefully curated collection of sweet memories.